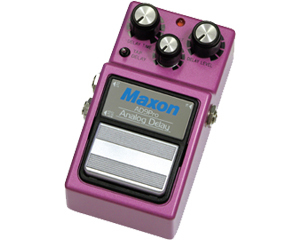 The new AD-9 Pro model improves on one of Maxon’s most coveted models in order to produce the best-sounding, most reliable analog delay ever. Featuring 4 of Maxon’s proprietary MC4107D bucket brigade IC’s, and the world’s first RMS level sensor and companding noise reduction system, the AD-9 Pro delivers 450 millseconds of the most transparent analog delay sound ever available in a stompbox format. Offering improved headroom, the AD-9 Pro can accept any input signal and will work in an amplifier’s effects loop as well as its front-end. The AD-9 Pro also features a switchable multi-head tape echo simulator function. This feature provides interesting new delay effects such as the “Ping Pong” repeats made famous by Tape Echo units as well as ambient effects that recreate the echoes of a large concert hall with stunning accuracy. AD-9 Pro is outfitted with mechanical true bypass switching on both wet and dry outputs by use of a 4PDT switch assuring pure, unaltered tone when bypassed. In a world that grows more “digital” by the day, the Maxon AD-9 Pro sets a new standard of analog innovation. Dimensions: 2.9" x 4.88" x 2.13"